Most homeowners like to focus on creating comfortable, functional and attractive places on their property. This is why they hire Massachusetts landscape designers to provide them various outdoor living plans and designs. Your garden and yard can be used optimally if you have the right kind of features installed. This is where Ivy Studio, your trusted eastern Massachusetts landscaping design experts, comes in. Building kitchen counters- L-shape, U-shape, parallel, with ‘or without an island etc. We have extremely skilled designers on board and they know exactly how to add custom designed grills to your outdoor kitchen. 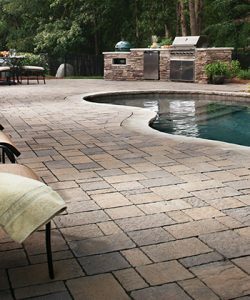 We use the highest grade materials in our work and ensure that skilled hardscape construction professionals are deployed for the job. The priority is to create spaces you will love to use and entertain in. In this case, too, we identify what kind of fuel source you want to use and provide solutions that meet your wishes. Get started on your landscape design project today to have a beautiful custom outdoor kitchen designed and installed, or take a look at our other landscape design services we offer to the greater Boston and Massachusetts Bay area.